Humanizing a monarch is a tricky business. You need enough grave mystique of the Office of the Crown to make modern audiences begrudgingly buy it; on TV, monarchy is functionally a fantasy element, and requires the same worldbuilding. But human frailty is what keeps us tuning in. It’s unfortunate timing for Victoria to premiere in America in the shadow of The Crown, which also followed the early reign of a Queen as she navigates muddy political waters. They’re attempting slightly different things—Victoria is well aware that you’re probably watching more for Rufus Sewell’s longing glances than for an unflinching look at 1830 political processes—but given the narrative parallels, comparison is inevitable. The Crown had Prestige TV understated-dialogue/extended-eye-contact ratios and confidence in its tone; the weight of obligation was in every frame. (Hell, the opening credits were a supernatural circlet-forging.) Victoria is attempting—well, everything. 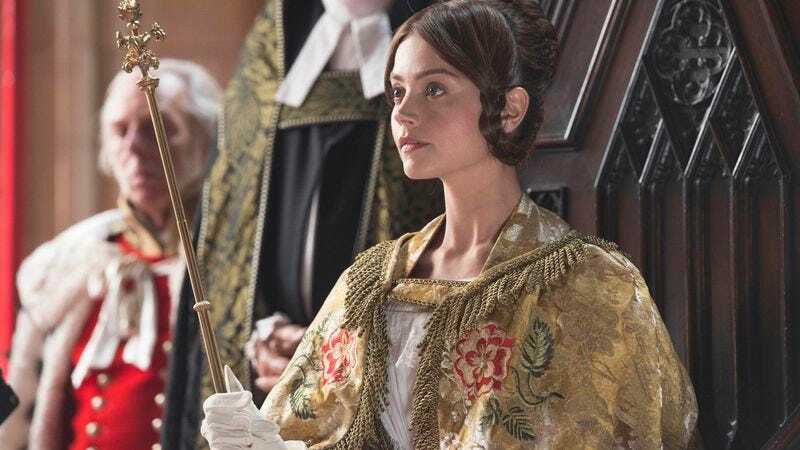 That means this episode has to do all the work of a superhero origin story: establish Victoria’s current circumstances, introduce the Victorian political landscape, wave a hand at class and social issues, introduce a love interest, and convince us Victoria’s up to the job. Since daylight and candlelight frame her beatifically, and her coronation scene is staged with all reverence, we assume this will become a fairly flattering take. (These credits have a choir lauding her!) But intercut with that coronation is Flora Hastings’ humiliation. It’s an emphasis on Victoria’s mistakes that’s the primary concern of this episode. The show’s clearly playing a long game, and Jenna Coleman’s largely up to the task. Some of the dialogue skirts After-School Special, but that’s not her fault. (John Conroy is so clearly bad news he hardly registers among the more nuanced antagonists like Lady Flora and her good but unwanted advice; no wonder Coleman does better wrangling the latter than the former.) And Coleman gives Victoria’s first tastes of power a nicely selfish edge—often best when she’s having a battle of wills (or of The Heart, naturally) with Rufus Sewell’s Lord Melbourne. Sewell, clearly enjoying himself, veers delightfully between veteran statesman on the verge of retirement who sees a generation’s promise in the Queen and vaguely-reformed scoundrel who’s turning the longing glances up to Full Byron. Coleman and Sewell’s easy chemistry works well in their more platonic moments, and Coleman gives us the sense that Melbourne’s a way for Victoria to discover more about herself and how she wishes to rule – selfish, but in the way we like to see in powerful women. Her reliance on the man who pointedly shows up every time she’s in public distress makes total sense. And maybe that makes the longing glances inevitable, too; as unnecessary as the semi-love-triangle might turn out to be, we understand Victoria’s infatuation with the first man to treat her with fondness and respect. If the repressed romance gets so much emphasis that we start to feel more like an embarrassed courtier than caught up in the thrill of it, that’s probably part of the point. However, this leaves us between a rock and a hard place. Keep too close to Victoria and we risk judging her missteps; go too far from her and things quickly go broad. Below stairs, servants from Downton Abbey Central Casting do their trademark resentful grumbling and scheming, from hiding Dark Pasts to a ratcatcher subplot that lasts approximately two years. And on the fringes, ready to usurp the throne at any moment, Peter Firth’s Lord Cumberland palpably longs for a moustache to twist. But even if I don’t tend to buy it, there’s a core of sincerity to Victoria that begs you to forgive its less interesting moments. It’s a big ask, but fair enough considering how the series is shaping up. It’s trying to steer clear of camp, and it’s not particularly interested in being sober, so the only thing left is to be earnest. If someone has to advise the queen to “smile, and wave, and never let them know how hard it is to bear,” and somebody has to grimly announce Lady Flora has “shared a coach with Conroy quite alone,” you want the show to buy in. I have a soft spot for period pieces full of social conventions that are never as obsolete as we think and meaningful glances between people with An Understanding in the face of a cruel world. And monarchy-as-fantasy-element offers plenty of dramatic potential in characters who grab for power, steer nations, or sacrifice personal happiness for the sake of duty. But historically, quite a bit works out in Victoria’s favor, which means Victoria is always going to be on the knife’s edge of a fairy tale rather than a drama about the rigors of her rule. For now, it feels like the gauntlet’s been thrown by Lady Flora herself, both to the monarch and as a meta summons to the show itself: “To be a queen, you must be more than a little girl with a crown.” The rocky beginning is out of the way; let’s see what’s next. These baby blues on Jenna Coleman are as uncanny a set of contact lenses as I’ve ever seen and alter something of her whole affect. “I made it for her on the day I realized I would become queen” gets a straight-up serial-killer vibe. I do not understand them. And it’s not like they ran out of contact-lens money because they spent it on the green-screen effects. 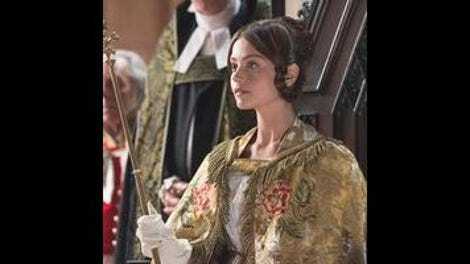 I really liked the scene at Dover House when Victoria faces down the political effect of her feelings for Lord Melbourne, the possibility of Lord Melbourne’s feelings for her, and what she wants out of it all…and instead of lingering on the tragedy she gets that political gleam in her eye. The relationship will never happen (spoilers for the nineteenth century), but I hope the show keeps this pragmatism in the subtext of their relationship. We also get another lingering shot of Victoria with that same look in her eye right after this, in case you missed it, which feels like the level of subtlety we should get used to. Rufus Sewell’s Full Byron is outstanding and he’s welcome to direct it at practically anybody for the duration of the series. Nigel Lindsay’s great as Robert Peel. Let Francatelli Suffer a Historically-Inaccurate But Deadly Disease 2017. Historical note: Odd that in an episode that’s mapped across modern superhero origin stories as much as prior monarchy tales, and that has enough time on its hands to get into a power struggle over tallow candles, the show skipped over the Kensington System. Besides one trip down the stairs and a mention of Victoria’s not being out in society, there’s almost no discussion of the most origin-story element of Victoria’s childhood. The Kensington System was a grueling education (almost eight hours a day), but it was also a system of deliberate isolation and dependence designed by John Conroy so he could, eventually, become the power behind the throne. (He also kept her from becoming close with her extended family, who hated him, and limited her playmates.) Victoria recognized the purpose and unfairness of the system, despite the lack of context in her childhood. Conroy’s unseemly enough here that we understand why Victoria hates him, but essentially, her first act of statecraft was resisting a domestic tyrant for years when she was powerless to dismiss him until the moment she was Queen. Vaguely related historical nitpick: Technically Victoria knew Latin perfectly well (thanks, Kensington System! ), but it was worth forgetting that part so she could look ignorant of “virgo intacta.” The relationship between Victorian ladies of a Certain Class and the pathologizing of sexual information is a fascinating one even before you factor in the distinct childishness of her education. The Queen was probably not going to be able to make much of a gynecology report; it’s nice that it played out relatively understated. Less understated historical nitpick: Victoria’s mother definitely had the Champagne Talk with her.